In a city lined with pathbreaking towers and skyscrapers, the River Beech project, if it comes to fruition, may earn its own chapter in the history of Chicago architectural marvels. That’s because this proposed 80-story tower, a joint research project between Cambridge University, Perkins + Will, and Thornton Tomasetti would be a tall wooden tower, a landmark in the accelerating development of high-tech timber as a new type of 21st century building material. 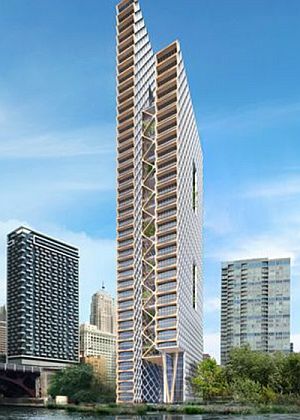 According to Tsay Jacobs and his colleague Todd Snapp, an architect and principal at Perkins + Will’s Chicago office, this is a serious design representing the firm’s belief in the material, and the potential of a new generation of tall timber towers. Designed to fit in with the firm’s Riverline project, a huge riverfront development, though it isn’t actually part of the proposal (it’s more to give it a real world site and circumstances to inform the design) the 80-story beechwood structure would be the world’s tallest wooden tower if completed. The River Beech project follows other proposals and research aimed at encouraging tall timber towers, including a Skidmore, Owings & Merrill proposal to build a wooden skyscraper. According to Snapp, the difference with River Beech is that the designers started from scratch and focused on engineering and designing the best possible wooden tower (The SOM plan sought to recreate a traditional concrete structure with wood). While it’s still in an early research phase, the River Beech plan shows a vision of a future that many architects and engineers feel isn’t a far-fetched as many may believe. Since it was first introduced last fall, the design has been tweaked and updated, and Tsay Jacobs believes it’s only a matter of testing, and updating building codes, before tall timber becomes a common part of construction.